Rizal's two famous literary works, i.e. Noli Me Tangere and El Filibusterismo, were forbidden reading materials (with threats of eternal damnation to those who disobey) by the Catholic Church. It was only during my late teens did I dare read them and only then did I understand why the Church forbade (the contents were much anticlerical, etc. ); I think more correctly that the Church hierarchy simply mistrusted (and maybe still does) the natives' intellectual maturity. In similar vein, from the time of American colonization to the present, the availability of the Communist Manifesto, Das Kapital or "What is to be Done?" and other Marxist, Leninist or Maoist publications (simply read = communist literatures) have been made difficult to obtain primarily due to fear of communism by the colonizers then; and successive native ruling regimes thereafter. Of course, the Catholic and Protestant churches of various flavors are still very much against "godless Communism." In fact, these latter considerations weigh significantly in our vehement anticommunism. I doubt if there are honest-to-goodness university courses on Marxism in our homeland given our deep anticommunism. I doubt if there is any available professor teaching such a course. If there is such a course or teacher, I doubt if the course is taught with much thoroughness and objectivity (in lieu of just attacking Marxist theories). It would be understandable if there were no courses on Marxism since even in the United States, it has been and is difficult to get tenure to teach Marxism. A simple search in the internet yields some American colleges and universities that offer courses on Marx, but not as many as one would expect from a nation that proclaims itself as THE defender of democracy (implying openness to all ideas/freedom to dissent). By comparison, Western European countries are more open about the market of ideas --in this case socioeconomic and political -- including dissenting or opposing ones such as Marxism-- as true democracy should be. Include India, our fellow Asian nation which is more democratic in this regard. Communism in India has a significant presence and active involvement in governing though not dominating the nation. Note that not one of these European nations or India became a communist country. Communism can still have some significant popularity, as in Italy, but in the long-run they never gained control. As I mentioned in past postings, let us be reminded not to equate socialists with communists (think of the Scandinavians). Additionally and unfortunately, we Filipinos usually and automatically equate or label nationalism as communism. We obviously have historically and are presently unaware that decades ago Eastern European nationalist-communists --labeled "bourgeios nationalists"-- were overtly persecuted and murdered by Russian communists led by Stalin especially during his "1930s' Great Purge" to expand and maintain Russian-ruled communist empire (note that in later years Yugoslavia's Tito, China's Mao, and Vietnam's Ho Chi Minh were more nationalists while communists but not Russian stooges). In comparison, nowadays American hegemony and/or imperialism is kept by covertly supporting, as America does in other poor countries in Latin America, our native military to do violence to unarmed Filipino nationalists by labeling the latter as all either "communists" or "terrorists" to rationalize their extrajudicials acts. 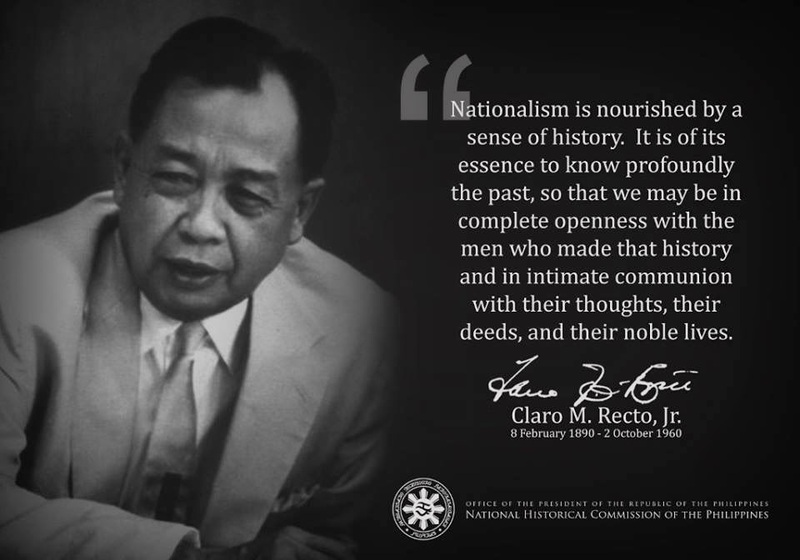 Without critical thinking, we Filipinos just follow what American colonization has conditioned us Filipinos about the "evils" of Marxism (and/or "extreme" nationalism); as a people continue our socioeconomic and political ignorance, continue with our caged minds and thus fail to totally comprehend the roots of and resolve our perpetual poverty and misery. Karl Marx was one of the great (if not greatest), influential thinkers from the 19th century whose theories have great impact on 20th century minds, and which still live among self-proclaimed Marxist regimes ruling over millions (over a billion till just over a decade ago). Marx has presented an excellent analysis of man and society --of his time; and many of his theories still apply today and in the foreseeable future. Given Marx's and later Lenin's ideas, to watch and reflect on the past and current affairs in the world and our homeland, i.e. economic globalization (imperialism in a more subtle form called neocolonialism aka neoliberalism): the logic of maximized profits drives capitalist expansion to/exploitation of poor nations; growth of multinationals or transnationals, the economic basis of politics, conflicts in class interests, etc. ; one can see much correctness and validity in their economic theories. On the other hand, it can be stated that Marx was pretty narrow in theorizing that we humans are essentially materialistic, that is, an "economic" man - solely driven by economic considerations. However, even if as humans we are significantly "economic" beings, given our better knowledge and understanding of man at this point in time or human history, we appreciate and realize that we are much more complex beings than that. Because we humans are truly multidimensional: we can also be the "spiritual man","practical man", "psychological man," "technological man," "philosophical man," "military man," etc. aside from being an "economic man." And thus we cannot simplify human conflicts as due only to class conflicts, however dominant this latter may be. In subsequent realities, Marx and Engels were proven wrong too in their communist theories about: the proletariat (industrial workers) as THE revolutionaries, instead we saw and still see revolutions by landless peasants in non-industrialized countries; in theorizing too that workers of the world will unite against capitalism, instead workers of different countries did not unite (both men apparently under-appreciated the greater force of nationalism); not foreseeing the capacity of modern capitalism to gradually change for the better treatment of workers, etc. And we all know that revolutions were/are mostly a mix of different socioeconomic classes, though not significantly of the ruling class. Fast forward today, economic globalization via IMF and WB, and other capitalist means (aka "free market or free trade") in leveraging for WTO, through which the transnationals aka multinationals are negating these worker gains in developed and underdeveloped countries. Gone is the era of the simple capitalists, i.e. individual, family or small corporations, who have been replaced by the extremely impersonal, humngous transnational corporations, not easily controllable by even their advanced governments. And thus nowadays, whole nations suffer; as in our homeland with its vanishing native middle class, under perpetual and worsening misery and poverty, early death, etc. while the coopted native rulers and foreigners are the only exempted. With globalization, it seems that Lenin's thoughts in his book Imperialism, the Highest Stage of Capitalism are coming back to reflect our present realities. As stated above, we Filipinos truly need to learn about and understand Communism in all its variations in theory and practice, with a self-knowledge that understanding is neither agreement nor endorsement (but necessary for one's decision-making: agreement or rejection) . And to really learn, it is always best to go to the primary sources or documents. So towards that end, I am posting here The Communist Manifesto (1888 English version) which defines the "what, why, how, where and when" of world communism - a messianic ideal against the exploitation of man by Capitalists; and in practice, exploitation of man by the members of the Communist Party. Mass ignorance makes possible the exploitation of the majority either for the benefit of capitalists (mostly foreigners and transnationals as presently in our homeland) or for the benefit of the Communist Party members under totalitarian communism (as happened in the former Soviet Union). Only a large, informed and thus active middle class can prevent/stop both possibilities. Marx, who drew up this programme to the satisfaction of all parties, entirely trusted to the intellectual development of the working class, which was sure to result from combined action and mutual discussion. The very events and vicissitudes in the struggle against capital, the defeats even more than the victories, could not help bringing home to men's minds the insufficiency of their various favorite nostrums, and preparing the way for a more complete insight into the true conditions for working-class emancipation. And Marx was right. The International, on its breaking in 1874, left the workers quite different men from what it found them in 1864. The Manifesto itself came thus to the front again. Since 1850, the German text had been reprinted several times in Switzerland, England, and America. In 1872, it was translated into English in New York, where the translation was published in _Woorhull and Claflin's Weekly_. From this English version, a French one was made in _Le Socialiste_ of New York. Since then, at least two more English translations, moer or less mutilated, have been brought out in America, and one of them has been reprinted in England. The first Russian translation, made by Bakunin, was published at Herzen's Kolokol office in Geneva, about 1863; a second one, by the heroic Vera Zasulich, also in Geneva, in 1882. A new Danish edition is to be found in _Socialdemokratisk Bibliothek_, Copenhagen, 1885; a fresh French translation in _Le Socialiste_, Paris, 1886. From this latter, a Spanish version was prepared and published in Madrid, 1886. The German reprints are not to be counted; there have been twelve altogether at the least. An Armenian translation, which was to be published in Constantinople some months ago, did not see the light, I am told, because the publisher was afraid of bringing out a book with the name of Marx on it, while the translator declined to call it his own production. Of further translations into other languages I have heard but had not seen. Thus the history of the Manifesto reflects the history of the modern working-class movement; at present, it is doubtless the most wide spread, the most international production of all socialist literature, the common platform acknowledged by millions of working men from Siberia to California. Yet, when it was written, we could not have called it a _socialist_ manifesto. By Socialists, in 1847, were understood, on the one hand the adherents of the various Utopian systems: Owenites in England, Fourierists in France, both of them already reduced to the position of mere sects, and gradually dying out; on the other hand, the most multifarious social quacks who, by all manner of tinkering, professed to redress, without any danger to capital and profit, all sorts of social grievances, in both cases men outside the working-class movement, and looking rather to the "educated" classes for support. Whatever portion of the working class had become convinced of the insufficiency of mere political revolutions, and had proclaimed the necessity of total social change, called itself Communist. It was a crude, rough-hewn, purely instinctive sort of communism; still, it touched the cardinal point and was powerful enough amongst the working class to produce the Utopian communism of Cabet in France, and of Weitling in Germany. Thus, in 1847, socialism was a middle-class movement, communism a working-class movement. Socialism was, on the Continent at least, "respectable"; communism was the very opposite. And as our notion, from the very beginning, was that "the emancipation of the workers must be the act of the working class itself," there could be no doubt as to which of the two names we must take. Moreover, we have, ever since, been far from repudiating it. "However much that state of things may have altered during the last twenty-five years, the general principles laid down in the Manifesto are, on the whole, as correct today as ever. Here and there, some detail might be improved. The practical application of the principles will depend, as the Manifesto itself states, everywhere and at all times, on the historical conditions for the time being existing, and, for that reason, no special stress is laid on the revolutionary measures proposed at the end of Section II. That passage would, in many respects, be very differently worded today. In view of the gigantic strides of Modern Industry since 1848, and of the accompanying improved and extended organization of the working class, in view of the practical experience gained, first in the February Revolution, and then, still more, in the Paris Commune, where the proletariat for the first time held political power for two whole months, this programme has in some details been antiquated. One thing especially was proved by the Commune, viz., that "the working class cannot simply lay hold of ready-made state machinery, and wield it for its own purposes." (See _The Civil War in France: Address of the General Council of the International Working Men's Assocation_ 1871, where this point is further developed.) Further, it is self-evident that the criticism of socialist literature is deficient in relation to the present time, because it comes down only to 1847; also that the remarks on the relation of the Communists to the various opposition parties (Section IV), although, in principle still correct, yet in practice are antiquated, because the political situation has been entirely changed, and the progress of history has swept from off the Earth the greater portion of the political parties there enumerated. The bourgeoisie, historically, has played a most revolutionary part. The bourgeoisie, wherever it has got the upper hand, has put an end to all feudal, patriarchal, idyllic relations. It has pitilessly torn asunder the motley feudal ties that bound man to his "natural superiors," and has left remaining no other nexus between man and man than naked self-interest, than callous "cash payment." It has drowned the most heavenly ecstasies of religious fervour, of chivalrous enthusiasm, of philistine sentimentalism, in the icy water of egotistical calculation. It has resolved personal worth into exchange value. And in place of the numberless and feasible chartered freedoms, has set up that single, unconscionable freedom -- Free Trade. In one word, for exploitation, veiled by religious and political illusions, naked, shameless, direct, brutal exploitation. The bourgeoisie has stripped of its halo every occupation hitherto honoured and looked up to with reverent awe. It has converted the physician, the lawyer, the priest, the poet, the man of science, into its paid wage labourers. The need of a constantly expanding market for its products chases the bourgeoisie over the whole surface of the globe. It must nestle everywhere, settle everywhere, establish connexions everywhere. The bourgeoisie has through its exploitation of the world-market given a cosmopolitan character to production and consumption in every country. To the great chagrin of Reactionists, it has drawn from under the feet of industry the national ground on which it stood. All old-established national industries have been destroyed or are daily being destroyed. They are dislodged by new industries, whose introduction becomes a life and death question for all civilised nations, by industries that no longer work up indigenous raw material, but raw material drawn from the remotest zones; industries whose products are consumed, not only at home, but in every quarter of the globe. Independent, or but loosely connected provinces, with separate interests, laws, governments and systems of taxation, became lumped together into one nation, with one government, one code of laws, one national class-interest, one frontier and one customs-tariff. The bourgeoisie, during its rule of scarce one hundred years, has created more massive and more colossal productive forces than have all preceding generations together. Subjection of Nature's forces to man, machinery, application of chemistry to industry and agriculture, steam-navigation, railways, electric telegraphs, clearing of whole continents for cultivation, canalisation of rivers, whole populations conjured out of the ground -- what earlier century had even a presentiment that such productive forces slumbered in the lap of social labour? A similar movement is going on before our own eyes. Modern bourgeois society with its relations of production, of exchange and of property, a society that has conjured up such gigantic means of production and of exchange, is like the sorcerer, who is no longer able to control the powers of the nether world whom he has called up by his spells. For many a decade past the history of industry and commerce is but the history of the revolt of modern productive forces against modern conditions of production, against the property relations that are the conditions for the existence of the bourgeoisie and of its rule. It is enough to mention the commercial crises that by their periodical return put on its trial, each time more threateningly, the existence of the entire bourgeois society. In these crises a great part not only of the existing products, but also of the previously created productive forces, are periodically destroyed. In these crises there breaks out an epidemic that, in all earlier epochs, would have seemed an absurdity -- the epidemic of over-production. Society suddenly finds itself put back into a state of momentary barbarism; it appears as if a famine, a universal war of devastation had cut off the supply of every means of subsistence; industry and commerce seem to be destroyed; and why? Because there is too much civilisation, too much means of subsistence, too much industry, too much commerce. The productive forces at the disposal of society no longer tend to further the development of the conditions of bourgeois property; on the contrary, they have become too powerful for these conditions, by which they are fettered, and so soon as they overcome these fetters, they bring disorder into the whole of bourgeois society, endanger the existence of bourgeois property. The conditions of bourgeois society are too narrow to comprise the wealth created by them. And how does the bourgeoisie get over these crises? On the one hand inforced destruction of a mass of productive forces; on the other, by the conquest of new markets, and by the more thorough exploitation of the old ones. That is to say, by paving the way for more extensive and more destructive crises, and by diminishing the means whereby crises are prevented. The theoretical conclusions of the Communists are in no way based on ideas or principles that have been invented, or discovered, by this or that would-be universal reformer. They merely express, in general terms, actual relations springing from an existing class struggle, from a historical movement going on under our very eyes. The abolition of existing property relations is not at all a distinctive feature of Communism. All property relations in the past have continually been subject to historical change consequent upon the change in historical conditions. The French Revolution, for example, abolished feudal property in favour of bourgeois property. We Communists have been reproached with the desire of abolishing the right of personally acquiring property as the fruit of a man's own labour, which property is alleged to be the groundwork of all personal freedom, activity and independence. Hard-won, self-acquired, self-earned property! Do you mean the property of the petty artisan and of the small peasant, a form of property that preceded the bourgeois form? There is no need to abolish that; the development of industry has to a great extent already destroyed it, and is still destroying it daily. Or do you mean modern bourgeois private property? To be a capitalist, is to have not only a purely personal, but a social status in production. Capital is a collective product, and only by the united action of many members, nay, in the last resort, only by the united action of all members of society, can it be set in motion. Capital is, therefore, not a personal, it is a social power. When, therefore, capital is converted into common property, into the property of all members of society, personal property is not thereby transformed into social property. It is only the social character of the property that is changed. It loses its class-character. In bourgeois society, living labour is but a means to increase accumulated labour. In Communist society, accumulated labour is but a means to widen, to enrich, to promote the existence of the labourer. In bourgeois society, therefore, the past dominates the present; in Communist society, the present dominates the past. In bourgeois society capital is independent and has individuality, while the living person is dependent and has no individuality. And the abolition of this state of things is called by the bourgeois, abolition of individuality and freedom! And rightly so. The abolition of bourgeois individuality, bourgeois independence, and bourgeois freedom is undoubtedly aimed at. It has been objected that upon the abolition of private property all work will cease, and universal laziness will overtake us. According to this, bourgeois society ought long ago to have gone to the dogs through sheer idleness; for those of its members who work, acquire nothing, and those who acquire anything, do not work. The whole of this objection is but another expression of the tautology: that there can no longer be any wage-labour when there is no longer any capital. All objections urged against the Communistic mode of producing and appropriating material products, have, in the same way, been urged against the Communistic modes of producing and appropriating intellectual products. Just as, to the bourgeois, the disappearance of class property is the disappearance of production itself, so the disappearance of class culture is to him identical with the disappearance of all culture. That culture, the loss of which he laments, is, for the enormous majority, a mere training to act as a machine. But don't wrangle with us so long as you apply, to our intended abolition of bourgeois property, the standard of your bourgeois notions of freedom, culture, law, etc. Your very ideas are but the outgrowth of the conditions of your bourgeois production and bourgeois property, just as your jurisprudence is but the will of your class made into a law for all, a will, whose essential character and direction are determined by the economical conditions of existence of your class. The selfish misconception that induces you to transform into eternal laws of nature and of reason, the social forms springing from your present mode of production and form of property-historical relations that rise and disappear in the progress of production -- this misconception you share with every ruling class that has preceded you. What you see clearly in the case of ancient property, what you admit in the case of feudal property, you are of course forbidden to admit in the case of your own bourgeois form of property. Abolition of the family! Even the most radical flare up at this infamous proposal of the Communists. On what foundation is the present family, the bourgeois family, based? On capital, on private gain. In its completely developed form this family exists only among the bourgeoisie. But this state of things finds its complement in the practical absence of the family among the proletarians, and in public prostitution. The bourgeois family will vanish as a matter of course when its complement vanishes, and both will vanish with the vanishing of capital. Do you charge us with wanting to stop the exploitation of children by their parents? To this crime we plead guilty. But, you will say, we destroy the most hallowed of relations, when we replace home education by social. And your education! Is not that also social, and determined by the social conditions under which you educate, by the intervention, direct or indirect, of society, by means of schools, etc.? The Communists have not invented the intervention of society in education; they do but seek to alter the character of that intervention, and to rescue education from the influence of the ruling class. The bourgeois clap-trap about the family and education, about the hallowed co-relation of parent and child, becomes all the more disgusting, the more, by the action of Modern Industry, all family ties among the proletarians are torn asunder, and their children transformed into simple articles of commerce and instruments of labour. But you Communists would introduce community of women, screams the whole bourgeoisie in chorus.The bourgeois sees in his wife a mere instrument of production. He hears that the instruments of production are to be exploited in common, and, naturally, can come to no other conclusion than that the lot of being common to all will likewise fall to the women. He has not even a suspicion that the real point is to do away with the status of women as mere instruments of production. The Communists are further reproached with desiring to abolish countries and nationality. The working men have no country. We cannot take from them what they have not got. Since the proletariat must first of all acquire political supremacy, must rise to be the leading class of the nation, must constitute itself the nation, it is, so far, itself national, though not in the bourgeois sense of the word. National differences and antagonisms between peoples are daily more and more vanishing, owing to the development of the bourgeoisie, to freedom of commerce, to the world-market, to uniformity in the mode of production and in the conditions of life corresponding thereto.The supremacy of the proletariat will cause them to vanish still faster. United action, of the leading civilised countries at least, is one of the first conditions for the emancipation of the proletariat. In proportion as the exploitation of one individual by another is put an end to, the exploitation of one nation by another will also be put an end to. In proportion as the antagonism between classes within the nation vanishes, the hostility of one nation to another will come to an end. The charges against Communism made from a religious, a philosophical, and, generally, from an ideological standpoint, are not deserving of serious examination.Does it require deep intuition to comprehend that man's ideas, views and conceptions, in one word, man's consciousness, changes with every change in the conditions of his material existence, in his social relations and in his social life? What else does the history of ideas prove, than that intellectual production changes its character in proportion as material production is changed? The ruling ideas of each age have ever been the ideas of its ruling class.When people speak of ideas that revolutionise society, they do but express the fact, that within the old society, the elements of a new one have been created, and that the dissolution of the old ideas keeps even pace with the dissolution of the old conditions of existence. The Communist revolution is the most radical rupture with traditional property relations; no wonder that its development involves the most radical rupture with traditional ideas. But let us have done with the bourgeois objections to Communism. We have seen above, that the first step in the revolution by the working class, is to raise the proletariat to the position of ruling as to win the battle of democracy. The proletariat will use its political supremacy to wrest, by degrees, all capital from the bourgeoisie, to centralise all instruments of production in the hands of the State, i.e., of the proletariat organised as the ruling class; and to increase the total of productive forces as rapidly as possible. These measures will of course be different in different countries. Nevertheless in the most advanced countries, the following will be pretty generally applicable. In the section of the French Legitimists and "Young England" exhibited this spectacle. In pointing out that their mode of exploitation was different to that of the bourgeoisie, the feudalists forget that they exploited under circumstances and conditions that were quite different, and that are now antiquated. In showing that, under their rule, the modern proletariat never existed, they forget that the modern bourgeoisie is the necessary offspring of their own form of society. What they upbraid the bourgeoisie with is not so much that it creates a proletariat, as that it creates a revolutionary proletariat. In political practice, therefore, they join in all coercive measures against the working class; and in ordinary life, despite their high falutin phrases, they stoop to pick up the golden apples dropped from the tree of industry, and to barter truth, love, and honour for traffic in wool, beetroot-sugar, and potato spirits. As the parson has ever gone band in hand with the landlord, so has Clerical Socialism with Feudal Socialism. Nothing is easier than to give Christian asceticism a Socialist tinge. Has not Christianity declaimed against private property, against marriage, against the State? Has it not preached in the place of these, charity and poverty, celibacy and mortification of the flesh, monastic life and Mother Church? Christian Socialism is but the holy, water with which the priest consecrates the heart-burnings of the aristocrat. In countries like France, where the peasants constitute far more than half of the population, it was natural that writers who sided with the proletariat against the bourgeoisie, should use, in their criticism of the bourgeois regime, the standard of the peasant and petty bourgeois, and from the standpoint of these intermediate classes should take up the cudgels for the working class. Thus arose petty-bourgeois Socialism. Sismondi was the head of this school, not only in France but also in England. This school of Socialism dissected with great acuteness the contradictions in the conditions of modern production. It laid bare the hypocritical apologies of economists. It proved, incontrovertibly, the disastrous effects of machinery and division of labour; the concentration of capital and land in a few hands; overproduction and crises; it pointed out the inevitable ruin of the petty bourgeois and peasant, the misery of the proletariat, the anarchy in production, the crying inequalities in the distribution of wealth, the industrial war of extermination between nations, the dissolution of old moral bonds, of the old family relations, of the old nationalities. The world of the German literate consisted solely in bringing the new French ideas into harmony with their ancient philosophical conscience, or rather, in annexing the French ideas without deserting their own philosophic point of view. This annexation took place in the same way in which a foreign language is appropriated, namely, by translation. It is German Socialism, which took its schoolboy task so seriously and solemnly, and extolled its poor stock-in-trade in such mountebank fashion, meanwhile gradually lost its pedantic innocence. It was a sweet finish after the bitter pills of floggings and bullets with which these same governments, just at that time, dosed the German working-class risings. While this "True" Socialism thus served the governments as a weapon for fighting the German bourgeoisie, it, at the same time, directly represented a reactionary interest, the interest of the German Philistines. In Germany the petty-bourgeois class, a relic of the sixteenth century, and since then constantly cropping up again under various forms, is the real social basis of the existing state of things. The robe of speculative cobwebs, embroidered with flowers of rhetoric, steeped in the dew of sickly sentiment, this transcendental robe in which the German Socialists wrapped their sorry "eternal truths," all skin and bone, served to wonderfully increase the sale of their goods amongst such a public. And on its part, German Socialism recognised, more and more, its own calling as the bombastic representative of the petty- bourgeois Philistine. A part of the bourgeoisie is desirous of redressing social grievances, in order to secure the continued existence of bourgeois society. To this section belong economists, philanthropists, humanitarians, improvers of the condition of the working class, organisers of charity, members of societies for the prevention of cruelty to animals, temperance fanatics, hole-and-corner reformers of every imaginable kind. This form of Socialism has, moreover, been worked out into complete systems. We may site Proudhon's Philosophie de la Misere as an example of this form. The Socialistic bourgeois want all the advantages of modern social conditions without the struggles and dangers necessarily resulting therefrom. They desire the existing state of society minus its revolutionary and disintegrating elements. They wish for a bourgeoisie without a proletariat. The bourgeoisie naturally conceives the world in which it is supreme to be the best; and bourgeois Socialism develops this comfortable conception into various more or less complete systems. In requiring the proletariat to carry out such a system, and thereby to march straightway into the social New Jerusalem, it but requires in reality, that the proletariat should remain within the bounds of existing society, but should cast away all its hateful ideas concerning the bourgeoisie. Bourgeois Socialism attains adequate expression, when, and only when, it becomes a mere figure of speech. Free trade: for the benefit of the working class. Protective duties: for the benefit of the working class. Prison Reform: for the benefit of the working class. This is the last word and the only seriously meant word of bourgeois Socialism. It is summed up in the phrase: the bourgeois is a bourgeois -- for the benefit of the working class. We do not here refer to that literature which, in every great modern revolution, has always given voice to the demands of the proletariat, such as the writings of Babeuf and others. The first direct attempts of the proletariat to attain its own ends, made in times of universal excitement, when feudal society was being overthrown, these attempts necessarily failed, owing to the then undeveloped state of the proletariat, as well as to the absence of the economic conditions for its emancipation, conditions that had yet to be produced, and could be produced by the impending bourgeois epoch alone. The revolutionary literature that accompanied these first movements of the proletariat had necessarily a reactionary character. It inculcated universal asceticism and social levelling in its crudest form. The Socialist and Communist systems properly so called, those of Saint-Simon, Fourier, Owen and others, spring into existence in the early undeveloped period, described above, of the struggle between proletariat and bourgeoisie (see Section 1. Bourgeois and Proletarians). The founders of these systems see, indeed, the class antagonisms, as well as the action of the decomposing elements, in the prevailing form of society. But the proletariat, as yet in its infancy, offers to them the spectacle of a class without any historical initiative or any independent political movement. Since the development of class antagonism keeps even pace with the development of industry, the economic situation, as they find it, does not as yet offer to them the material conditions for the emancipation of the proletariat. They therefore search after a new social science, after new social laws, that are to create these conditions. Historical action is to yield to their personal inventive action, historically created conditions of emancipation to fantastic ones, and the gradual, spontaneous class-organisation of the proletariat to the organisation of society specially contrived by these inventors. Future history resolves itself, in their eyes, into the propaganda and the practical carrying out of their social plans. In the formation of their plans they are conscious of caring chiefly for the interests of the working class, as being the most suffering class. Only from the point of view of being the most suffering class does the proletariat exist for them. The undeveloped state of the class struggle, as well as their own surroundings, causes Socialists of this kind to consider themselves far superior to all class antagonisms. They want to improve the condition of every member of society, even that of the most favoured. Hence, they habitually appeal to society at large, without distinction of class; nay, by preference, to the ruling class. For how can people, when once they understand their system, fail to see in it the best possible plan of the best possible state of society? Hence, they reject all political, and especially all revolutionary, action; they wish to attain their ends by peaceful means, and endeavour, by small experiments, necessarily doomed to failure, and by the force of example, to pave the way for the new social Gospel. Such fantastic pictures of future society, painted at a time when the proletariat is still in a very undeveloped state and has but a fantastic conception of its own position correspond with the first instinctive yearnings of that class for a general reconstruction of society. They, therefore, violently oppose all political action on the part of the working class; such action, according to them, can only result from blind unbelief in the new Gospel. The Owenites in England, and the Fourierists in France, respectively, oppose the Chartists and the Reformistes. In Switzerland they support the Radicals, without losing sight of the fact that this party consists of antagonistic elements, partly of Democratic Socialists, in the French sense, partly of radical bourgeois. In Poland they support the party that insists on an agrarian revolution as the prime condition for national emancipation, that party which fomented the insurrection of Cracow in 1846. The Communists turn their attention chiefly to Germany, because that country is on the eve of a bourgeois revolution that is bound to be carried out under more advanced conditions of European civilisation, and with a much more developed proletariat, than that of England was in the seventeenth, and of France in the eighteenth century, and because the bourgeois revolution in Germany will be but the prelude to an immediately following proletarian revolution. In short, the Communists everywhere support every revolutionary movement against the existing social and political order of things. In all these movements they bring to the front, as the leading question in each, the property question, no matter what its degree of development at the time. Finally, they labour everywhere for the union and agreement of the democratic parties of all countries. The Communists disdain to conceal their views and aims. They openly declare that their ends can be attained only by the forcible overthrow of all existing social conditions. Let the ruling classes tremble at a Communistic revolution. The proletarians have nothing to lose but their chains. They have a world to win.